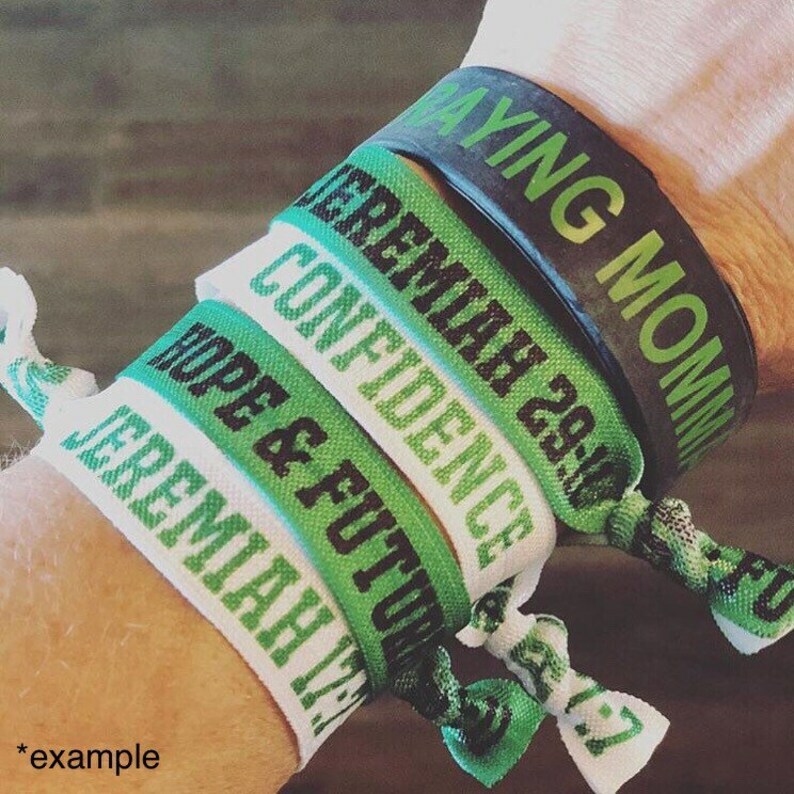 Please describe in detail what you’d like your custom hair ties to look like. Desired colors, fonts, images, etc. If you have a logo, please send in direct message. Thanks! Looking forward to working with you! Add ANY TEXT or LOGO to Hair Ties! Please contact us via direct message here on Etsy with your design idea, logo, images, colors, fonts, etc. You will receive back a proof to approve before printing begins. 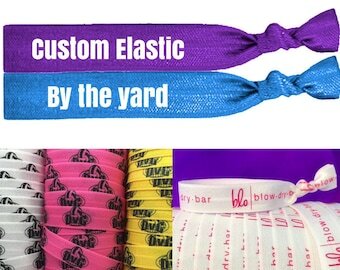 Promotional Hair Ties (stretchy wristbands) can be customized with your company’s name, advertising message, or logo. Or use them to promote sports teams, as branded goodies at weddings and baby showers, and as giveaways at trade shows. Printed in Full Color, multiple colors can be printed! Any image created on a computer can be transferred onto the elastic. Your custom Hair Ties will be packaged in cellophane or organza bags. No display cards included. Message me if you need them on display cards packaged in cellophane, as it is an extra charge. Measurements: approx. 5/8" wide and approx. 3" from knot to end. All Hair Ties are meticulously handmade and always heat-sealed to prevent fraying. See photo that shows several of the custom hair ties that we have made. Visit us on Instagram, Facebook, & Twitter to find special sales and coupon codes! Thank you so much! They came out even better than expected! Great quality and shipping was earlier than expected.